The current popularity of gluten-free foods has prompted the creation of many wheat-free versions of traditional baked goods, including Scottish shortbread. It turns out that this actually isn’t an innovation at all. Historically shortbread was a food of the poor in Scotland and was made with oat flour, which is (usually) gluten-free. 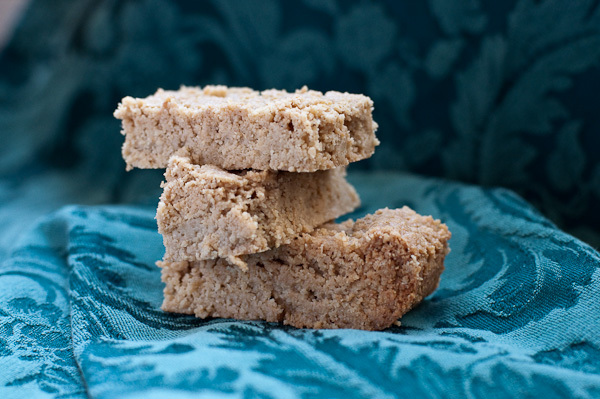 While looking for old recipes, for this tea-time staple, I came across several 19th Century Scottish recipes which called for a mixture of wheat flour and rice flour. I thought this was very strange as rice is a food that would have been fairly new to 19th Century Scotland and we know that shortbread has existed since at least the 16th century. I also saw some reference to replacing some of the flour with cornstarch as a secret way to make a more crumbly shortbread. Both of these methods are lowering the gluten content of the flour which results in a tender, crumbly pastry. Linguists aren’t quite sure why such pastry is called “short.” One theory compares the shortbread to bricks made with a mixture of mud and straw and then baked in the sun. If you cut the pieces of straw too short, the bricks will be fragile and crumble. Perhaps the chefs of the time thought the consistency of shortcrust or shortbread was similar to those crumbly bricks, hence the name. I can’t prove it, but it seems like all of these “modern” variations using rice and cornstarch are just trying to regain the original texture which was provided by oat flour. The earliest written recipe we have for shortbread is from a 16th Century cookbook written by and for the nobility. At that time, oat flour was associated with the poor and so it is doubtful it would have been found in the author’s kitchen. Instead, his recipe uses wheat flour and we’ve been trying to get back that crumbly texture ever since. These turned out rich, butter, not too sweet, and with a nutty undertone from the oat flour. Perfect with a cup of tea and also not bad stuck into a bowl of ice cream. Oat flour is easily available in health food stores, or you can make your own by running some rolled oats through a blender or food processor. Please note that if you are gluten sensitive, some commercial oat flour is processed in factories where wheat is present, so be sure check the label and make sure it is truly gluten-free. Also, an important note about substituting different kinds of flours: measure by weight, not volume. For example, oat flour weighs less than all-purpose flour, if you use the same amount of all-purpose by volume you’ll end up with cement. Use a portable hand mixer, or a stand mixer with the paddle attachment to cream the butter and sugar together until light and fluffy. Stir together the oat flour and salt and add them to the butter and sugar. Use a spatula to gently fold the ingredients together until they form a lumpy, dry dough with pieces the size of pebbles. Press the dough into a well-buttered 8 x 8 inch square pan. Bake for about 55-60 minutes, or until just barely brown. Remove from the oven and let cool in the pan for about 10 minutes before using a butter knife to cut the shortbread into fingers (I ended up with about 18 of them). If you would like to decoratively prick the tops of the fingers with a fork, you can do that now as well. Put the pan on a cooling rack and allow it to cool completely before removing the pieces of shortbread. They can be stored in an air tight container for about a week. Shortbread is wonderful for variations, you can add chopped nuts, or caraway seeds, or chopped candied fruit. An exotic version could contain chopped dried rose petals, chopped pistachios and a dash of rose water.